Refrigerator | Ice Maker | Cook Top | Oven | Stove | Dishwasher | And More! 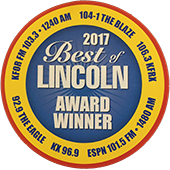 Andy’s is the premier Factory Certified Jenn-Air service company in Nebraska and western Iowa factory authorized for many years. We service Jenn-Air luxury kitchen appliances as a core competency in our business. As a result we have gained an unparalleled depth and breadth of knowledge and skill in the full Jenn-Air product line for warranty and non-warranty repairs alike. Jenn-Air luxury kitchen appliances are among the best built on the market today. Jenn-Air remains a core competency for Andy’s Appliance repair as we have been factory certified for many years an have repaired hundreds of Jenn-Air appliances. Our technicians are factory trained and authorized receiving specialty training to ensure that Andy’s continues to be the leader in all Jenn-Air appliance repair. We get it done RIGHT! Andy’s is a factory certified service company approved to perform warranty and non-warranty repairs on the full product line of Jenn-Air appliances. We provide certified Jenn-Air repairs for the full product line of kitchen appliances including dishwashers, ranges / range tops, wall ovens, refrigerators, chest freezers, warming drawers and ventilation units. We also carry full line of Jenn-Air parts for those who want to tackle it themselves. Andy’s stands by our work with a full 1 year parts and 1 year labor warranty for the work that we do. We use only factory OEM parts to bring your appliance back into factory specifications and keep it there. 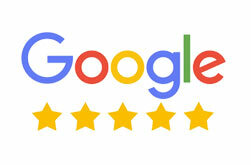 We have been in business for 47 years with highly trained and very skilled technicians. Call Andy’s Appliance Repair and get your Jenn-Air appliance fixed RIGHT! 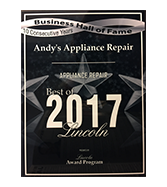 Experience: Andy’s has been in business for 47 years, our technicians have an average of 17 years experience and we continue to send our technicians to training multiple times per year which is why we are considered the premier appliance repair company in Nebraska. Training and Expertise: Andy’s Repair Technicians have spent many hours learning Jenn-Air kitchen appliances. We continue to send our technicians for advanced training on new appliances, new product lines and new technology in the industry so that we always remain current and the experts in the ever changing appliance repair field. 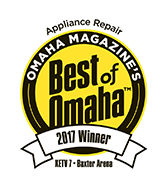 These are some of the reasons that Andy’s Appliance Repair is considered the premier appliance repair company in Omaha, Lincoln and surrounding communities. Guarantee: We stand by our work with industry leading 1 year parts and labor guarantee. We stand by our work and get the job done RIGHT, the first time. Honest Assessment: Our technicians will diagnose the problem, give you an estimate and explain the repair so that you can make an informed decision. We get your approval before we do any work and then we make sure it’s done right and with factory OEM parts. Our Technicians: Andy’s technicians arrive in uniforms and in clearly marked Andy’s van. Our employees are screened and background checked for your piece of mind and many have been with Andy’s for a long time. Technology: As factory authorized service company we are connected to Jenn-Air engineers for technical support, documents, drawings and wire diagrams. Our technicians have computers and smart phones to connect with the Jenn-Air engineers and to order parts while still in customer’s home to expedite the process. The technician will send the receipt to the customer before he leaves. We’ve got you covered! For Jenn-Air Appliance Repair, We’ve Got You Covered!